Carlos Boozer is an American professional basketball player who currently plays for the Chicago Bulls of the National Basketball Association (NBA). As a member of the Team USA, Boozer won an Olympic bronze medal at the 2004 Summer Olympics and an Olympic gold medal at the 2008 Summer Olympics. 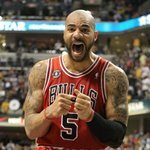 Boozer declared for the 2002 NBA Draft, relinquishing his final year of NCAA eligibility. He was drafted by the Cleveland Cavaliers in the second round of the NBA draft. 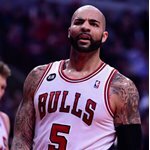 Boozer averaged 10.0 ppg and 7.5 rpg in his rookie campaign, and followed it up with 15.5 ppg and 11.4 rpg his second year while playing alongside LeBron James. 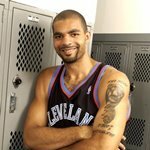 After the 2003–04 NBA season, the Cavaliers had the option of allowing him to become a restricted free agent, or keeping him under contract for one more year at a $695,000 salary. 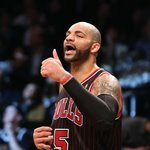 The Cavaliers claimed to have reached an understanding with Boozer and his agent on a deal for approximately $39 million over 6 years, which he would have signed if they let him out of his current deal. Cleveland then proceeded to release him from his contract making him a restricted free agent. 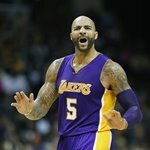 During this period, the Utah Jazz offered Boozer a 6-year, $70 million contract that Cleveland chose not to match due to salary cap considerations. Carlos Boozer signed with Utah on July 24, 2004. In his first season with the Jazz (2004–05), Boozer averaged 17 points and 9 rebounds. However, he suffered an injury, missing the later part of the season, which contributed to the Jazz missing the playoffs for only the second time in 22 years, and he was publicly criticized for a lack of effort by team owner Larry Miller. 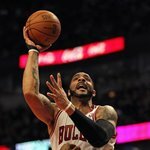 As the 2005–06 NBA season began, Boozer was still recovering from injury, and then aggravated a hamstring, causing him to miss the first half of that season as well. He returned to action in late February, easing into action by coming off the bench for the Jazz. In the middle of March, he was placed back into the starting lineup. From that point, he finished the season in impressive fashion, averaging over 20 points and almost 10 rebounds per game and firmly establishing himself as the Jazz's starting power forward once again. Boozer got off to a strong start in the 2006–07 seasons, winning the Western Conference Player of the Week Award and helping the Jazz to win eleven of their first twelve games. 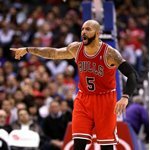 Boozer was named part of the NBA All-Star roster as a reserve, but could not participate because of a hairline fracture in his left fibula.